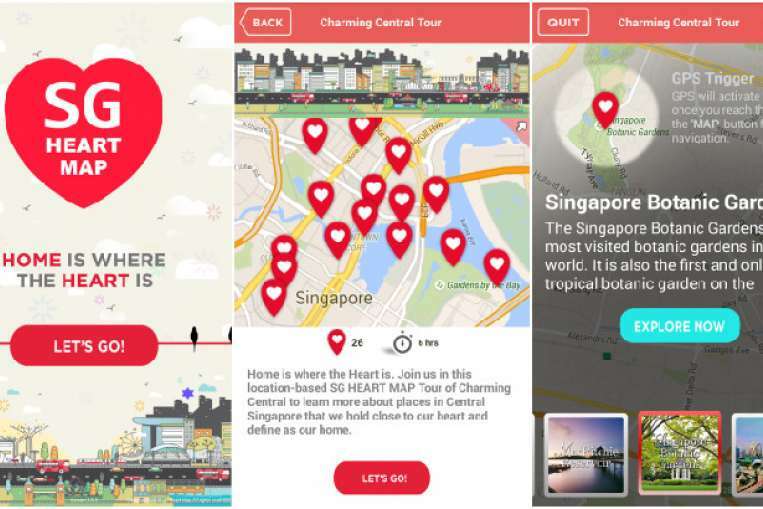 A new mobile application featuring trails around Singapore has been launched by SG Heart Map.Since last November, the SG Heart Map initiative has been collecting stories from Singaporeans about different places. Earlier this year, from more than 85,000 entries submitted, 50 spots were identified as most significant to people here, including Mount Faber Park and Punggol Waterway. The new mobile application, called SG Heart Map Tours, features seven self-guided trails based on these spots. Five of them cover different areas of Singapore. For instance, the South-West tour covers 15 places such as Haw Par Villa and West Coast Park. The application detects users’ locations and provides them with information about each place including trivia and stories contributed by Singaporeans. The remaining two trails focus on parks and food centres. Minister Grace Fu, Co-Chair of the SG50 Environment and Infrastructure Committee overseeing the SG Heart Map project, on Friday (Aug 7) morning joined Singaporeans at the Woodlands Waterfront Park for the North-West tour. Members of the public can download the android mobile application for free from Google Play. The Apple version will be released at the end of August. Visit www.heartmap.sg for more details. Copyright © 2017 LDR Technology Pte. Ltd. | All rights reserved.